a party 25 years in the making! At exactly 1:25 today, the agency celebrated our 1st employee to reach 25 years of service. 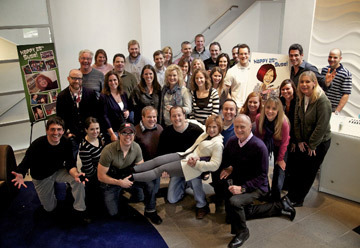 Congratulations to Susie Shire, Broadcast Producer (and fiery redhead), for all you’ve done – and still do. 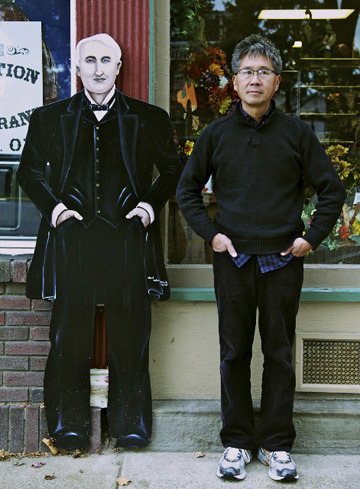 Here’s Director of Photography Ted Chu with Thomas Edison during our latest shoot for Lake Erie Shores and Islands. (Did you know Ohio is the birthplace of T.E.?) Now that’s a lot of brain power! 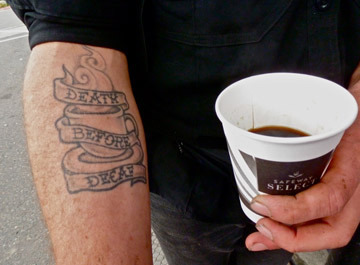 Our West Coast Taste Tour for Safeway Supermarkets’ new gourmet coffees just kicked off in Portland, Oregon, where – as you can tell from this honest-to-goodness customer tattoo – they take their java very seriously. Helping the brave men and women of the armed services has never tasted this good. Here’s a fun poster and in-store sign campaign we just did for Wendy’s and the USO. my, what big bulbs you have! It’s Christmas in October… sort of. 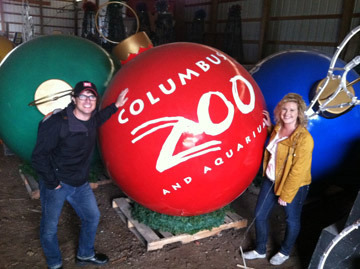 Check out Gene and Lisa getting ready for the big Zoo Wildlights shoot. Production begins tomorrow!